The T&M company used its IBC ‘for your eyes only’ room to show a prototype technology to enable 12 Gbps eye and jitter analysis on its Rx modular rack mount series. 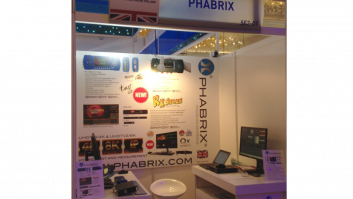 Paul Nicholls, Phabrix sales and marketing director, said the technology was capable of supporting all 4K and UHDTV1 formats on a dedicated platform built on its test and measurement toolsets. The technology is expected to be ready for release at NAB 2015. “The technology we are working on and displaying at IBC is a leap ahead of anything currently available in the market,” added Nicholls. “There have been a lot of announcements about 4K, but there’s still largely a misunderstanding of the many formats and colour spaces associated with these new higher resolution and higher frame rate formats.